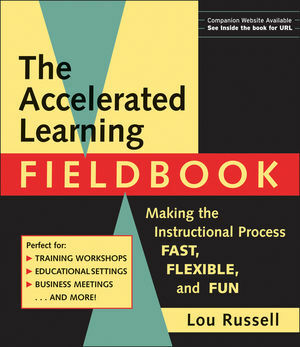 The Accelerated Learning Fieldbook gives you the toolsyou need to ensure that maximum learning and maximum retention aretaking place in your training sessions, sales sessions, andclassrooms. * Measure the effectiveness of a learning session . . . andmore! No other accelerated learning resource will offer you as manyup-to-date tips, techniques, processes, and theories. Everythingyou need to create a learning organization--including a music CD tolearn by--is between these covers. Enhance learning, foster aquicker grasp of the concepts you present, and ensure greateroverall retention of your material with this complete, practical,and comprehensive fieldbook. Lou Russell, CEO of Russell Martin & Associates is an executive consultant, speaker, and author whose passion is to create growth in companies by guiding the growth of their people. She is author of six popular and practical books including Leadership Training and 10 Steps to Successful Project Management. One: Starting the Learning Journey. Part One: How People Learn. Two: A Contract for Learning. Three: Learning to Take More In. Four: Learning Through All Your Intelligences. Five: Learining with Your Whole Brain. Six: Remembering What You Learned. Part Two: How Successful Learning is Delivered. Seven: You Are the Deliverer. Eight: The Environment Delivers Learning. Nine: Music to Deliver Learning. Part Three: How Successful Learning Events Are Built. Twelve: Your Learning Journey Continues.